This post was originally published in the September 2011 CUAA Newsletter. we pay special tribute to members of the Cooper community who contributed to relief efforts after September 11, 2001. The tribute highlights several projects, but is by no means an exhaustive list, of the many alumni, faculty, staff, and students involved in the recovery efforts during this trying time in New York City history. Members of the Cooper community perished as part of the World Trade Center disaster. 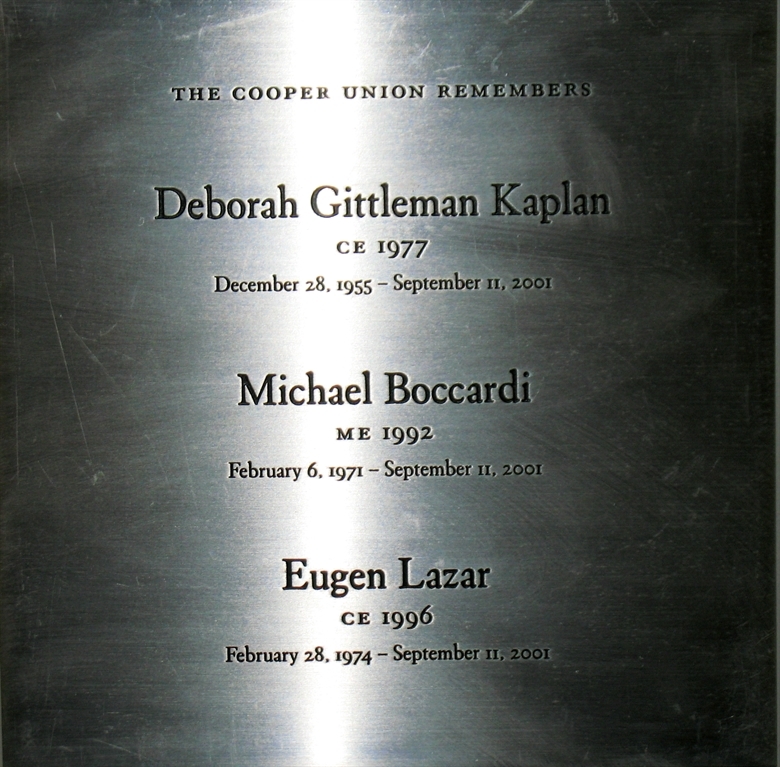 The Cooper Union Alumni Association had a plaque installed in the lobby of the Engineering School in their memory. 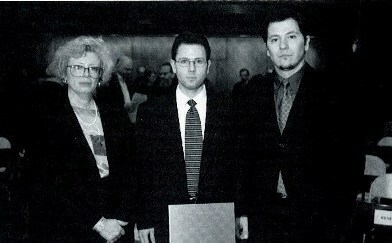 A dedication ceremony took place on February 20, 2002 in the Wollman Lounge. CUAA President Jacob Alspector, AR ’72, Dean Eleanor Baum and Cooper Union President George Campbell all presented remarks. Images from that day can be seen in the article “We Will Remember…” from the Spring-Summer 2002 edition of Clockworks below. A new plaque was placed in the Dean of Engineering office at 41 Cooper Square, following the closing of the old Engineering Building (left). Next we take a look back at The Cooper Union in 2001 through the Fall/Winter 2001 edition of atCooper. The next two articles highlight different ways in which the Cooper community contributed to recovery and relief efforts during this trying time in New York City history. “And Students Shall Lead Them,” the headline reported in the Saturday November 3rd issue of New York Newsday. More than 40 students from the Irwin S. Chanin School of Architecture, built a plexiglass, wood and styrofoam model of the damaged “bathtub” substructure of the World Trade Center which will be used to assist those working in the recovery efforts. Overseeing the project were Adjunct Professor Elizabeth O’Donnell, AR ’83 and alumnus Jiri Boudnik, AR ’96. Boudnik, a structural engineer, originally conceived the model when working at Ground Zero. He realized that a scale model of the ruined basement could be an invaluable aid to New York City’s engineers as they planned to excavate debris from the 7-story, 16-acre underground complex. 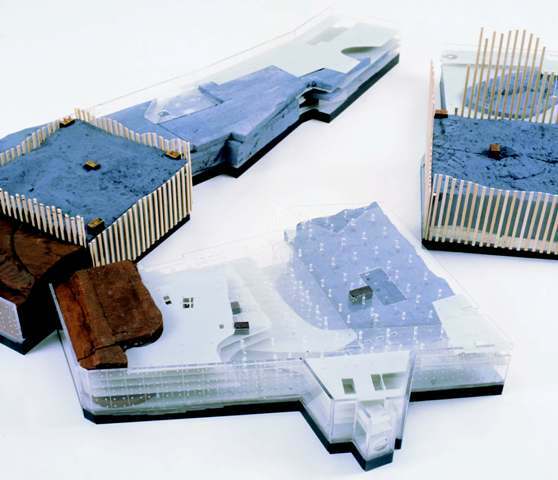 Boudnik shared this idea with Cooper Union architecture staff and immediately O’Donnell and her students started working on the model. Using structural documents, drawings, reports and personal accounts from the engineers at Ground Zero, they completed the project in four weeks. “It has been tremendously gratifying for me to work with students of such deep talent and tireless generosity: they drove the project forward through their midterm design reviews and exams. As one of the team said to me on the last night of the project, ‘Don’t worry about anything; this is what we do,'” O’Donnell commented during a press conference where the model was presented to city officials. Much public comment focused on the small scar placed on the heart. “The acknowledgement of injury is the beginning of healing,” Glaser told At Cooper Union. Less noticed in public discussion, though, was a subtle Glaser touch that further links the injured heart to the damaged city he loves: the scar sits on the heart’s lower left corner, roughly comparable to the spot on Manhattan maps that the twin towers once occupied. 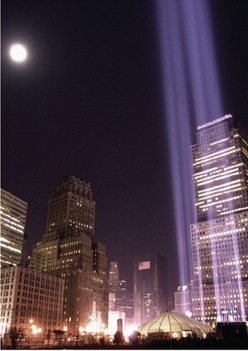 In September 2001, Julian LaVerdiere, A ’93 collaborated with several artists, architects and public art organizations on The Tribute in Light project — a New York City annual light memorial for the victims of the World Trade Center. 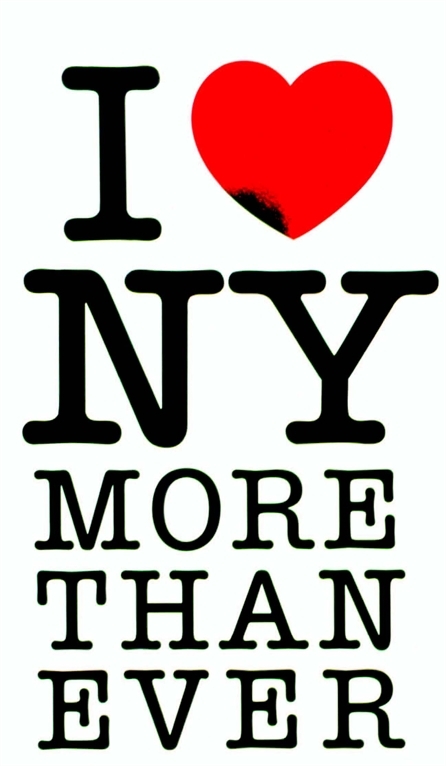 It initially ran as a temporary installation from March 11 to April 14, 2002, but later became an annual project produced by the Municipal Art Society of New York. Click here to learn more about The Tribute in Light Memorial. 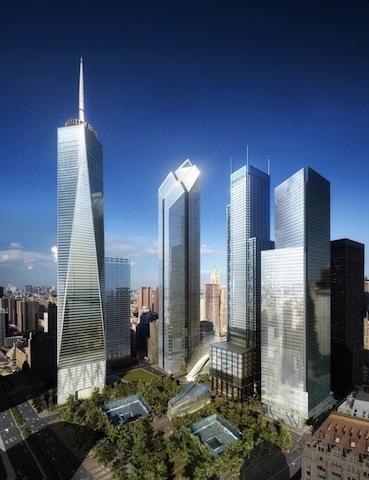 Daniel Libeskind, AR ’70 won the competition for the design of the Freedom Tower in February 2003. He gave a presentation about it to the Cooper community in a lecture presented in Wollman Hall that same year. Although his initial design underwent many changes over the years, Libeskind remained developer of the master plan to rebuild the World Trade Center. Daniel Broyles, ME ’06/MME ’07 served as Project Manager in charge of the waterfalls and plaza lighting, as well as coordination of the mechanical, plumbing, and electrical systems in the visitor center and the museum. 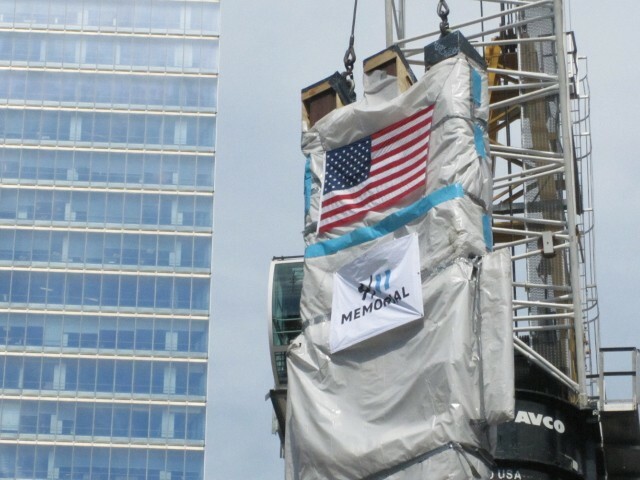 The World Trade Center Memorial opened to victims’ families on September 11, 2011. ME ’96 in front of memorial plaque. Family, friends, alumni and Cooper staff and faculty gathered to remember the lives of three of our alumni who perished in the World Trade Center attack. President Campbell, and Alumni Association President, Jacob Alspector AR ’72 addressed the crowd and spoke of the pain shared by all of us in the Cooper community. Linda Pawlusiow Mosch CE ’77 reminisced about her friendship with Deborah Gittleman Kaplan CE ’77 while at Cooper. Linda taught Deborah how to wear mascara and she, in turn, gave her tips on buying used textbooks. Adam Egelberg ME ’92 spoke of the generosity and zest for life embodied in his friend and classmate, Michael Boccardi ME ’92 and how, when prompted, he could recite entire episodes of Star Trek verbatim. A lasting friendship going back to high school was how Claudio Vaduva remembered Eugene Lazar CE ’96. They were so close that they were making plans to buy a multi-family house so that they could raise their families close together. Said Claudio about his friend “Eugene felt that having friends was not just a necessity, but almost an obligation.” The joy of their friendship and great sense of loss was deeply felt by all present in this close knit community. A plaque bearing the names of the three victims has been hung in the lobby of the School of Engineering so that we will always be reminded of them. This entry was tagged 9/11: A Retrospective, Adam Engleberg, Claudio Vaduva, Daniel Broyles, Daniel Libeskind, Deborah Gittleman Kaplan, Eugen Lazar, Freedom Tower, I Love New York Even More, Linda Pawlusiow Mosch, Michael Boccardi, Milton Glaser, Tribute in Light. Bookmark the permalink.